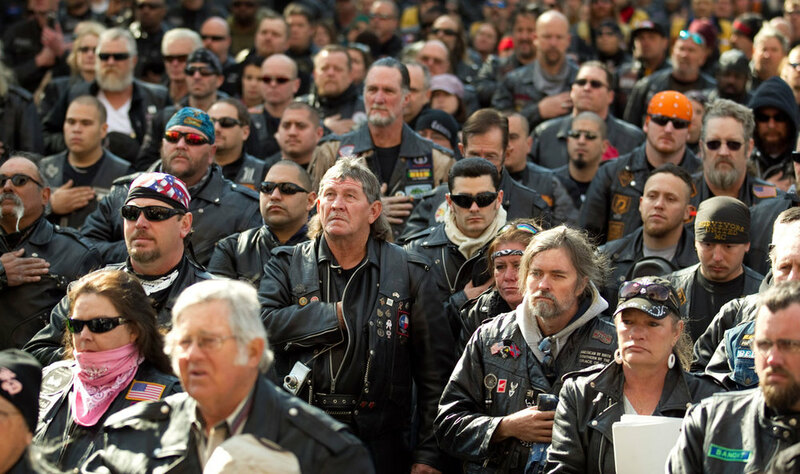 This past weekend in Brooklyn there was a biker block party— fuel-injected, not pedal-driven. Aside from the roaring exhaust pipes, the one thing that was impossible to ignore was the quality of the gathering. Men and women in the matching blue jeans, black shirts, and dark boots. Hard back slaps and bellowing belly laughs. These were people who came together for their love of bi-wheeled transportation, but were unified by a value system they could agree on. The signs might have said “block party,” but to me it looked like something else entirely— it looked like church. While I’m pretty sure none of the bikers there considered their crews or any sort of code of biking (that’s a thing, right?) a religion, what I do think they have is a group of people with values systems similar to their own. And while being a biker is not a religion, in a very literal sense a shared value system is a large part of what a religion provides people. But what about people who don’t have the abandon to jump on a hog or the faith to commit to a religion? It’s considered uncouth to speak about these things in polite company, in fact it’s actually banned at my own family gatherings along with any political discussions for fear of repeating the Thanksgiving ’10 incident. But putting aside all of the taboos and land mines that make treading upon this topic so precarious, there is an obvious value to religions— people who subscribe to most religions have a handbook to reference when making decisions. Regardless of how we feel about any of the beliefs set out in these books, there is a very concrete value system to cite when navigating the decision making process. The idea here is that someone who subscribes to a belief system, when presented with a difficult decision they’re unsure how to handle, will be able to reference the structured values already set out for them, and have a dynamic interpretation of this system based on the distinct circumstance they are facing. Imagine, for example, that you are a married Baptist on a business trip where someone makes a pass at you, how should you respond? As a Baptists you’ve got an answer that was literally carved in stone— “thou shalt not commit adultery.” There is no room for misinterpretation here. But things aren’t always this clear cut. Even people who would attest to the fact that they subscribe to one religion or another often still have caveats. “I’m a Catholic but I believe in gay marriage” or “I’m a Muslim but I believe in a woman’s right to choose.” What happens then? In the modern world we’re generating our belief systems on more than just our relationship with any one religious tradition or another. Today our belief systems are affected by our sense of nationality, regionality, and social mores. Our belief systems are affected by our jobs, our education, scientific discoveries, statistics, cultural exposure, an appreciation for respecting each others’ rights to make their own decisions and much, much more. The truth is that religious doctrine doesn’t always easily navigate modern society. The constant reinterpretation to meet contemporary culture is theoretically the duty of “the church” or other leadership bodies, but it tends to happen in fits and bursts, often out of sync with the pace of cultural change. In the case of Catholicism, we’ve been seeing a lot of this modernizing in the past six months under the new pope, Pope Francis, who has made a number of public statements updating the Vatican’s stance on a number of things. He’s spreading goodwill to the gay community, calling non-believers “allies,” and most recently hinting at opening the conversation about allowing priests to marry. But understandably, this is only the beginning of a long new era of modern stance taking by the church, you can’t just completely reinvent a two-millennia old tradition overnight. The thing is, people really hate ambiguity, and in the absence of another way to define our values we flock to anything that hints at them. We broadcast our Myers-Briggs type, we share what Harry Potter character we are on Facebook, and we fill out micro-bios and “about me” pages everywhere in an attempt to nail down who we are. We want to find that perfect description of what we believe, and we want everyone else to know, too. But these things only begin to touch on the bigger picture of what a value system could be. The closest thing to a modern value system builder isn’t necessarily in the place where we might think to look— certainly not in twenty-something Brooklyn— but people are defining their values every day when they fill out online dating profiles. The difference is that OKCupid isn’t proselytizing anyone. 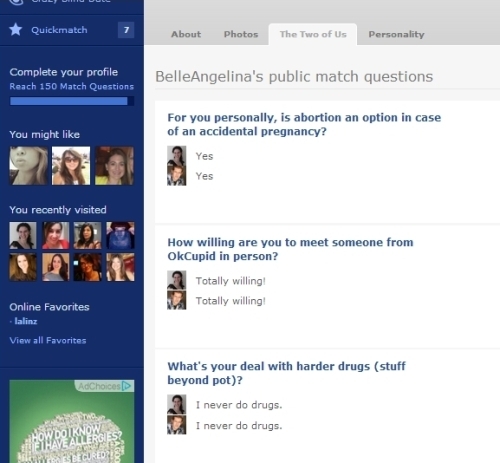 Instead it’s asking you questions to help you decide what’s most important to you. Of course this is completely relevant to the online dating process— having shared values is one of the most important aspects of any romantic relationship, regardless of how long you’re hoping it lasts. But once we leave the digital meat market, the hundreds of questions we answer don’t come with us. When it comes down to it, we live in an increasingly culturally fractured world. It’s driven by an individualistic philosophy that says it’s ok to build up the world around you to reflect the way you choose to view it. And independent of whether this individualism is the right way to approach the world or not, it has rendered certain older dogmatisms obsolete or at the very least insufficient in tackling modern life. But if we can agree that having a concrete value system each individual builds up on their own could be a helpful tool when facing tough decisions, then there is a hole in the world. If people could put as much effort into building their own value systems as they do laboring over dating profiles— it takes time!— who knows? Maybe the world might be just a little bit better off.